It was late, John and I were tired, and we had a crap load of eggs and a few veggies in the fridge. Enter the frittata. It sounds a lot fancier that it really is, doesn't it? Frittata. Go ahead and make one for breakfast, lunch, or dinner....it's good hot, it's good cold, and you'll feel like a regular ol' Julia Child. The recipe is below. Enjoy! 2. Whisk together eggs, basil, salt, pepper and 1/2 cup cheese in a bowl. 3. Add 1 tablespoon butter, and saute vegetables a 12-inch broiler-safe skillet over medium heat until just tender, about 2-4 minutes. 4. Add the remaining butter to the pan, and be sure to coat the sides. (Note: I added a little extra because I was cooking with stainless and didn't want the eggs to stick). Pour egg mixture into skillet and cook, lifting up cooked egg around edge using a spatula to let as much raw egg as possible flow underneath, until the fritatta is mostly set (don't mess with it too much in that stage or else you'll end up with a huge skillet of scrambled eggs). Sprinkle cheese evenly over top. 5. Broil frittata about 6 inches from heat until set, slightly puffed, and golden, 2 to 2 1/2 minutes. 6. 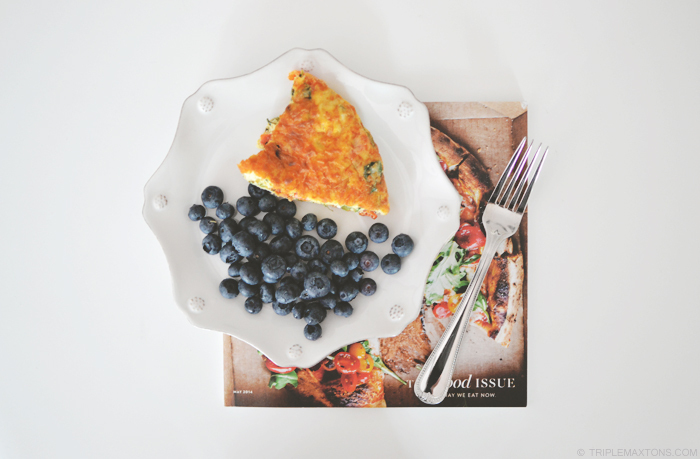 Cool frittata 5 minutes, then loosen edge with a clean spatula and slide onto a large plate. Cut into wedges.